The International Basketball Federation, more commonly known as FIBA, is an association of national organizations which governs international competition in basketball. It’s also an organization whose regulations ban athletes who wear religious headgear, including hijab, from playing basketball professionally. In response to many’s discomfort with the rule, FIBA established a two-year preliminary trial allowing religious headgear. This trial ends this August, when FIBA will decide to lift the ban or not. Ezdihar Abdulmula is a Libyan British basketball player who has not been silent about this ban. She discovered her passion for basketball at the age of 18, following her selection to play for her university and local team. 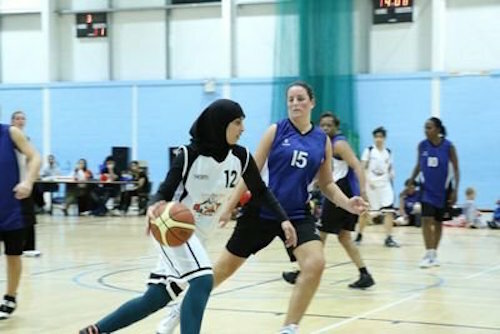 Abdulmula also wears hijab, and has been directly affected by FIBA’s hijab ban, potentially preventing her from playing the sport she loves professionally. Consequently, she joined a petition campaign on change.org requesting an extension to the two-year preliminary trial, which will be sent to Horacio Muratore, the current president of FIBA. Women and men who cover their heads for religious reasons should be entitled to participate in international sport free from this kind of discriminatory, ridiculous, and arbitrary interference. No athlete should be forced to compromise his/her beliefs or choose between faith and sport. Period. Abdulmula started this petition with other Muslim basketball players, and now has over 23,000 supporters. You can read their stories here: https://www.change.org/m/end-ban-on-head-covering-in-basketball. Please sign, share and use the #FibaAllowHijab hashtag to make a positive difference today.